Hybrid ICT are your local Australian Authorised Microsoft Office experts for supplying, licensing, installing, migrating, fixing and troubleshooting all versions of Microsoft Office. Microsoft Office includes a suite of programs including Microsoft Word, Microsoft Excel and Microsoft PowerPoint as standard with some versions including one or more of the following programs: Microsoft Outlook, Microsoft Publisher, Microsoft OneNote, Microsoft Access, Microsoft Exchange, Microsoft Teams, Skype, Entourage etc. 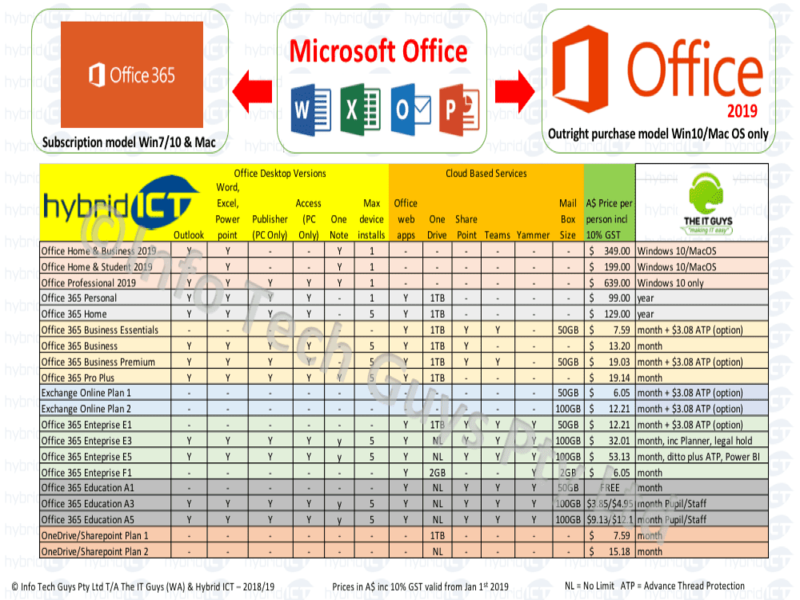 Support for Microsoft Office Versions 2011 (For Mac), Office 2007, Office 2008 (for Mac), Office 2004 (for Mac), Office 2003 and earlier has ended and continuing to use these versions renders devices open to security exploitation (hacking), data-loss, printing and formatting issues and will not run on Windows 10 or newer Mac OS versions. Hybrid ICT have a great deal of experience in migrating of older versions of office to current versions, including data migration. However, corrupt files saved in older OS formats (such as emails saved in Entourage files) may not be recoverable. Supported versions of office can usually be reinstalled providing clients have the original installation disks, a valid license key or access to their Microsoft Account and the version being installed is on a compatible operating system. Office 2019 is available as an outright purchase and maybe a solution for those organisations not yet ready to embrace Cloud-Computing. Office 2019 is the most expensive upgrade option available, does not offer any cloud storage options such as OneDrive or SharePoint, will only work on computers running Windows 10, does not offer an upgrade path from earlier versions and will need replacing every 3 years. 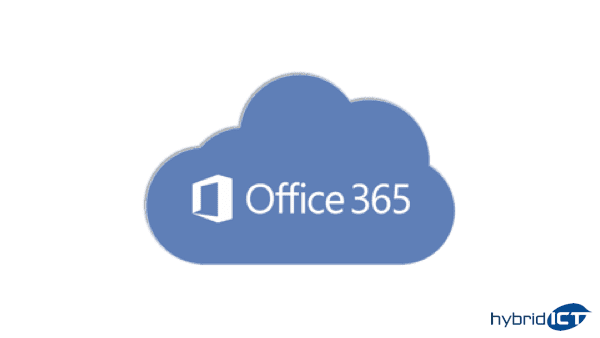 Alternatively, Microsoft Office 365 Business versions are purchased on a monthly or annual subscription basis which is constantly being updated and patched to the latest Office version and includes cloud features such as OneDrive, Skype and Teams and 1TB of cloud-storage per person. Some products include an Exchange Online Mailbox with up to 100GB of mail storage. With a subscription to Microsoft 365 Business, you can run your organization in the cloud and let Microsoft take care of the IT for you. It can manage devices, protect against real-world threats, and provide the latest in business software. With a monthly or yearly subscription, you get productivity apps, like Word, Excel, and PowerPoint, business-class communication with Outlook, Teams, and Yammer, cloud storage with One Drive and SharePoint, plus business apps that help you reach and work with your customers. In addition, you get Windows 10 Pro with updates. You get the tools to update, manage, and protect your computers and devices, including the devices your employees bring to work. You can install Office apps on these devices, safeguard their data, and lock them down if they are lost or stolen. When used together, you can grow your business with the latest cloud software and world-class protection by Microsoft. Hybrid ICT can save Small to Medium sized business up to A$1,869 per year on Microsoft or Telstra prices by making sure your company is not over-licensing. For a FREE assessment, our rates, charges and terms, please contact us.